Everett, WA - The Everett AquaSox and Funko, Inc. ("Funko") (Nasdaq:FNKO), a leading pop culture consumer products company located in downtown Everett have announced a six-year partnership which includes promotional giveaways, stadium decor and field naming rights. Everett Memorial Stadium will now be called Funko Field at Everett Memorial Stadium. "Funko has been a prominent fixture in the community since moving to downtown Everett. Our commitment to the community and our employees has never wavered," said Brian Mariotti, Chief Executive Officer of Funko. "This partnership is a terrific opportunity to further engage with our fans and neighbors by cheering on the home team together." Added AquaSox General Manager Danny Tetzlaff: "We are thrilled to announce this partnership with Funko. With a shared commitment to the local community, this will be a homerun for everyone for years to come. 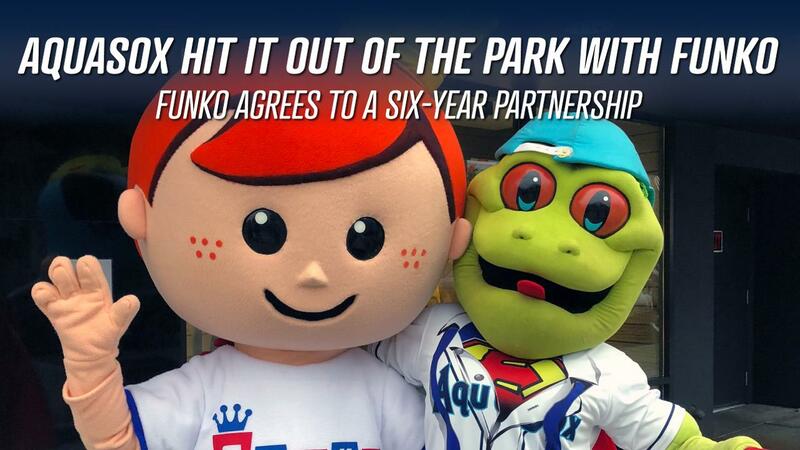 Partnering with the iconic Funko brand will make a night at the ballpark even more memorable!" In 2017 Funko relocated their headquarters to downtown Everett and their 17,000-square-foot flagship store is a hub where fans can gather, connect, and experience something truly magical. Funko Field will be no different as Funko Fridays will offer fans Funko related items and promotions at every Friday home game starting on Opening Night, Friday, June 21. Single-game tickets will be available for purchase online starting Tuesday, May 14 at 10 AM. Fans who would like to attend every Funko Friday can purchase a Friday Night Lights ticket plan online or by calling the AquaSox Front Office.